Ohhh I love a candle I do. Much to my husbands dismay as he really isn't a fan but when it comes to home accessories I most definitely have the final say! I like a variety of scents but there is one particular that stands above the rest and that is violets. I have become a firm fan of a particular brand that sells a parma violet scent and I've never found anything similar until I discovered Valley Mill Candles. 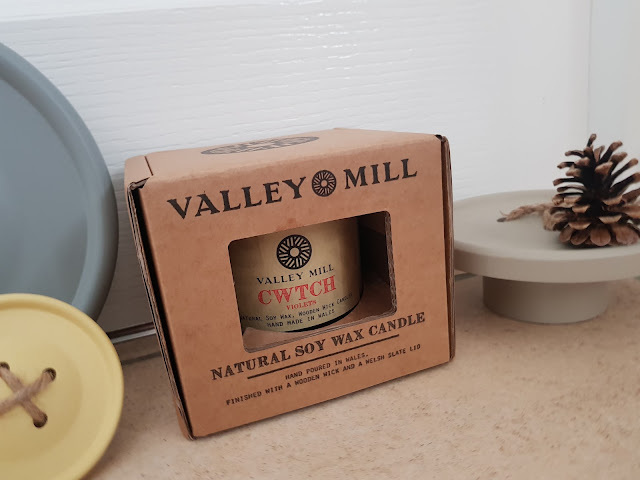 I was kindly offered the opportunity to review one of their lovely soy candles and immediately I knew that I had to have the 'cwtch' candle in violet fragrance. 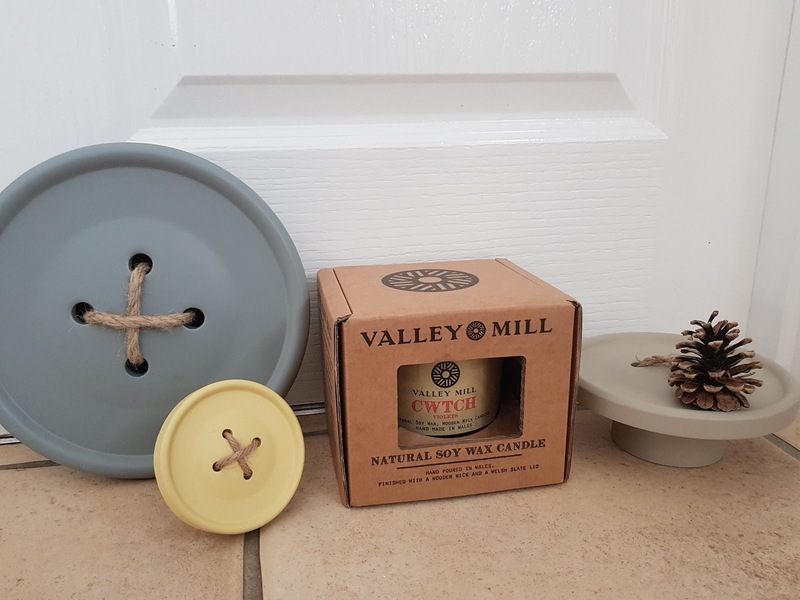 Valley Mill produce many items from soy wax candles, natural soaps as well as welsh slate products. All products are handmade in Wales to highest possible standard and using products sourced from Wales itself. I adore the rustic, yet modern packaging and appearance of the candle. 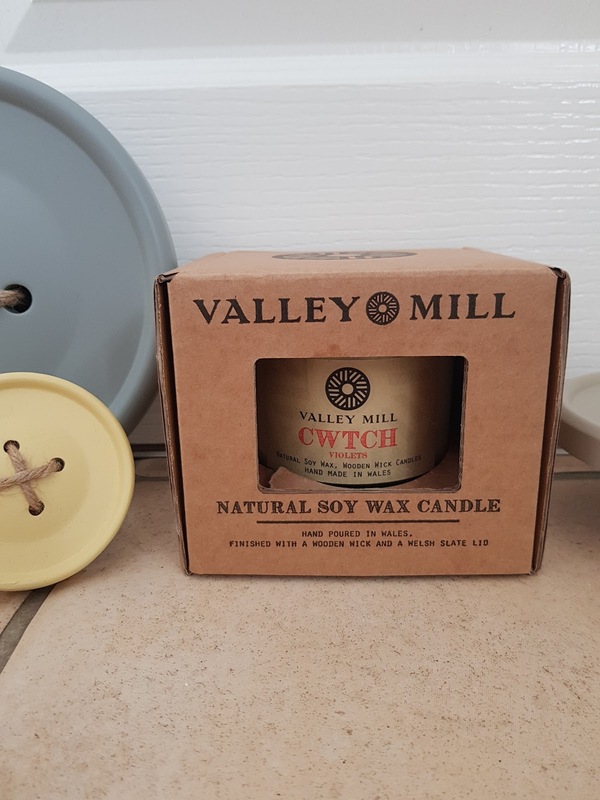 There is something about things being packaged in simple cardboard with black writing, it kind of lets the product speak for itself, I also love that the Valley Mill candles are in a rather robust glass tumbler topped with a welsh slate lid which doubles up as a coaster, it's a really nice touch. 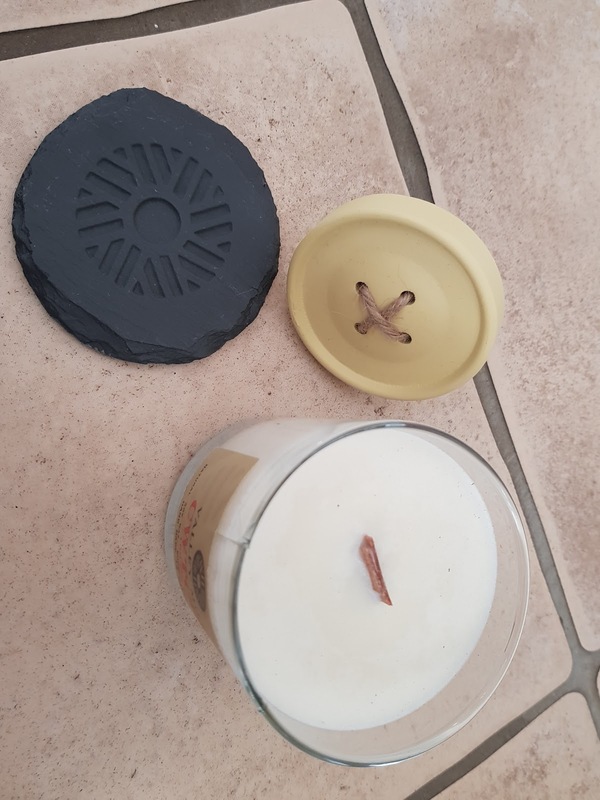 The candles are made from natural soy wax with a wooden wick to ensure a better scent throw (I've never heard it called this before but totally get what they mean as when the candle is burning the scent it lush). The wooden wick also ensures an increased burn time and an even surface area melt. Unfortunately when my candle arrived there was a crack in the glass, fortunately I was very kindly sent a replacement out which arrived in perfect condition - however I'd already taken the photos and was pretty pleased how they'd come out so have decided to stick with the original images, to be honest you can only see the crack a little and I can assure you that the company really were so quick to send out a new one so no concerns there. I can honestly say that this scent is just as nice as my usual violet candle (if not nicer!). I find the scent lingers around the house for a while which is so nice and I've used it several times and the wax hasn't really gone down much at all. 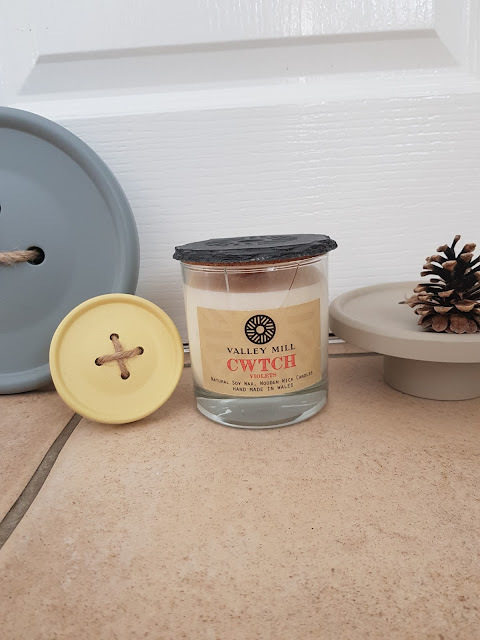 There is of course lots more lovely fragrances to choose from, I love the sound of the passion fruit, coconut and the mixed berry scent but the for the moment I'm just very much enjoying my cwtch candle. If you love parma violets then this candle is most definitely for you, it's such a sweet scent but not too overpowering. If you go and buy a pack of parma violets and give it a sniff that's pretty much what this candle smells like, delicious! So these fab candles retail for £16.99 and one of my lovely readers is in the chance to win one! If you love candles as much as I do this is a giveaway you will want to enter. Uk entries only I'm afraid and entry is via the Rafflecopter below. You will be able to choose your own fragrance from the candles available at the time of winning. Please ensure you leave a valid email and twitter name if you have one so I can contact you if you win! All that remains to say is good luck and thanks for stopping by! Lovely scents. I'd choose Jasmine which is one of my favourite fragrances. I'd love the Holly Berry for Christmas please! I love the spiced apple. I would love the holly berry! Spiced apple is my favourite scent, so definitely that! The mixed berries scent sounds nice! They sound lovely. I'd choose the coconut as it's my favourite. I'd choose passion fruit, it sounds amazing! Bara Brith but I might want to eat it. I'd pick Holly Berry because I love the festive christmas scents! I think I would probably choose spiced apple, it sounds yummy smelling! Cwtch (Violets) sounds absolutely gorgeous! My daughter is absolutely obsessed with candles and loves all the amazing scents. Roast chestnuts sound amazing, and very good for Christmas! The Roast Chestnut Soy Melts would be nice. I would choose Coconut Soy. I bet the coconut or the jasmine smell incredible! Ooooh I'd choose mixed berries for sure! I would choose the Jasmine one for my Mum. I love the sound of the Jasmine Soy Candle, thanks for the giveaway. I would choose the Jasmine or Coconut melts - or be greedy and try both! Spiced Apple sounds wonderful and very festive. i like the sound of Coconut Soy. I'd love the spiced apple. I'd love the Holly Berry for Christmas!